The Hornady Key Lock Safe 2600KL is certified child-resistant and constructed of heavy 14 gauge steel with dual internal locking lugs and a 4-point capture mechanism. Features include a spring-assist lid and it comes with a 1,500-lb rated cable for added security. Firearm not included. The Hornady Key Lock Safe 2600KL is certified child-resistant and constructed of heavy 14 gauge steel with dual internal locking lugs and a 4-point capture mechanism. Features include a spring-assist lid and it comes with a 1,500-lb rated cable for added security. 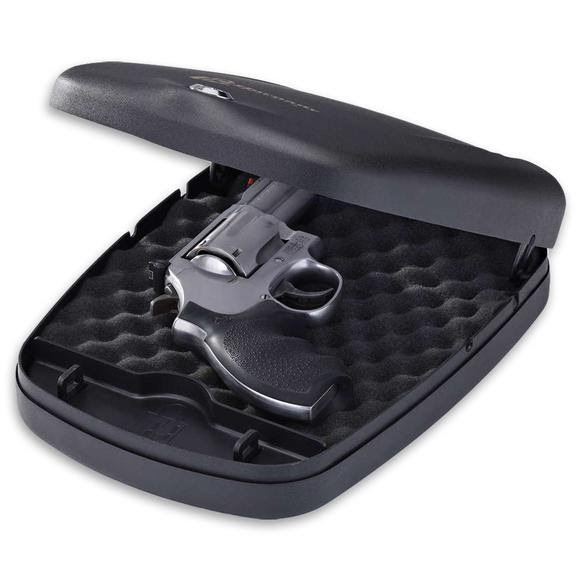 Exterior housing is made of thick 14 gauge steel with dual internal hardened locking lugs and 4-point capture mechanism. Included cable allows the safe to be secured in virtually any location. Meets TSA requirements for handgun safety in checked luggage. Dimensions Exterior: 10.7"x8.7"x2.9", Interior: 8"x7.7"x2.2"